Bull fighting still today remains popular in many parts of the world. Today is Independence Day in America. It is a day which gives us all a sense of pride in how much we have achieved since we became an Independent Nation. Over the past few hundred years we have fought, died and defended our country in the name of Freedom. But on this Day, I find quite little to feel proud or good about, when it come to the Freedom of America’s, indeed, the Whole World’s millions of desperate and abused animals. Who is fighting for their freedom? Yes, there are many animal activists, wildlife groups and individuals by the boatload, all professing to be doing their very best trying to keep animals out of harms way and alive. But, on this day, in this country, I ask who will fight for the Freedom of Animals ? Too many of us use them for our own personal benefit, without ever giving a thought to whether or not we are harming, or even killing them. We have all seen the horse and dog races, the bull fights, the Rodeos, and the terrible fate of the animals involved in them. We know about the fox hunts, the dog fights, polo matches and most of all, the grisly experiments under the guise of scientific research. We still in this country, have too many zoos, circuses and wildlife attractions galore, all of them placing profit over concern, or well-being or welfare, of the very animals that they hold hostage in them. Thousands, no, millions, of innocent Animals here and all over the World are continuously being exploited. They are being murdered, slaughtered, abused and terrorized by ruthless Humans for personal profit and individual gain. We all know who these people, these groups, these Organizations are, and yet, quite unbelievably, we still support them by taking ourselves and our families there to watch the abuse happen. We are not only watching, but by our very presence, are willing accomplices, to it. So many of us pretend that we truly care for animals, but deep down, we all know what happens behind the scenes, behind the closed doors, when no one is watching. Who will fight for their Freedom on this Independence Day? Will you speak out for them? Will you make a change in your life today, even a small one, that may make their lives better or safer? They have ALL suffered in silence long enough. Today could be the first Animal Independence Day, together we can, we must make the change. This entry was posted in America, Animal Abuse, Animal Activist, Animal advocates, Animal Experimentation, Animal Independence Day, Animal Issues, Animal Organizations, Animal Rights, Animal welfare, Animals, Bull Fights, Dog Fights, Dog Races, Fox Hunts, Horse Races, The World and tagged America, Animal Experimentation, Animal Independence Day, Animal Issues, Animal Rights, Animal welfare, animals, Bull Fights, Dog Races, Fox Hunts, Horse Races, The World, United States, Wildlife Issues. Bookmark the permalink. ← I am an ALLY, are you? A thought provoking article. I hope as our understanding of how animals are treated increases things will improve, but it is an uphill struggle. Many people fight for the rights of animals, yet still it seems that predominately little is done and the cruelty continues on a scale unimaginable. I think it is a matter of getting people to see things differently, to break habits that are so engrained in our upbringing is not easy. Personally I think going vegan is a good step forward as is writing about animal exploitation helping to educate others about what happens to the animals with whom we share this world. You are right on every count. 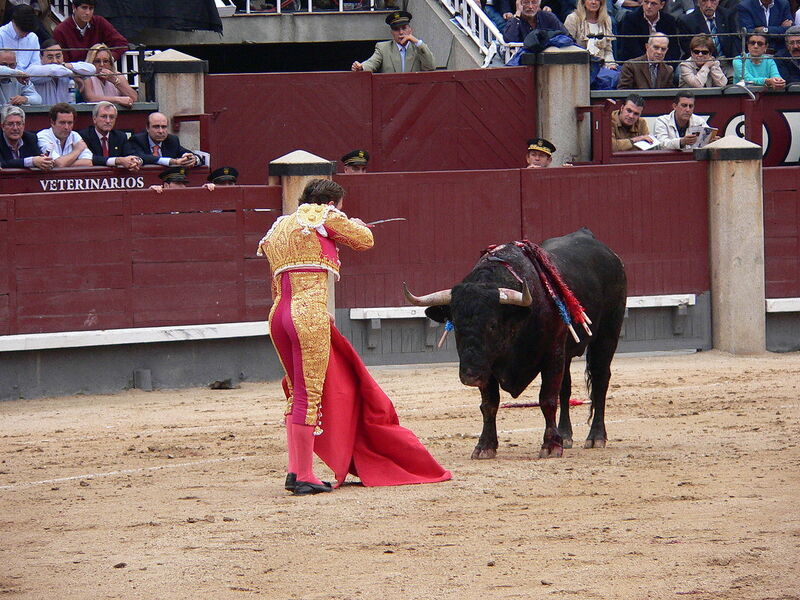 I first saw a bull fight on TV as a kid – it still disgusts me!! I saw my first and last one in Mexico when we were stationed at Ft Bliss in the late 60’s. Got up and left as soon as I saw what it was. We both hope you are having a wonderful day today. I feel bad for all the critters tonight. If they took the fireworks out of July 4th, the turkey out of Thanksgiving, and did away with Halloween entirely (so much plastic crap and ugliness), I would be very pleased. We have some demented traditions that only add injury to Mother Earth. And the thing is, people seem unwilling to make even small changes, as if they consider it their God-given right to drive Hummers, own assault weapons and set off explosives. Is decency teachable? Can ignorance be turned around? I’m beginning to doubt it. We will be keeping Breanna quite safe tonight, right next to us. She does not, like most animals, like the noise. If you look at the faces of those watching this horror, they don’t appear to be concerned for the life about to end. You are so very kind, however, I have been politely declining ALL Awards for many months now. They take precious time away from the 3 Blogs that I now have and accepting them and doing them right is very important. Hugs back to you and many thanks! Thank you so much for caring about them!